Huge competition weekend for Vesper and Azha. 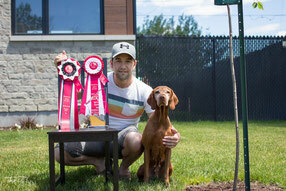 Vesper Q'ed 8 runs and got her MGDC (Master Gambler Dog Of Canada) title. In frisbee, she did a great trial with 29 points which got us our DDX (Disc Dog Excellent) title! 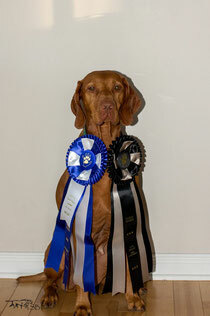 Azha was in conformation this weekend and got Best Of Winners on sunday good for 3 points (She now has 6). Thanks to Karyna Cazelais who showed her for Lysiane. On a special note, huge congratulations to Hendrix (Azha's brother, Mr. Blue) who participated in his first conformation show saturday and was brilliantly handled by his owner Audrey despite the stress of the first time. He Won his 9-12 class and we are super proud of him!